Suzuki's Alex Rins pipped Movistar Yamaha's Valentino Rossi to take his first MotoGP win at the Circuit of the Americas, as Marc Marquez failed to take his seventh straight win in Austin after crashing from the lead. Marquez crash also meant that there would finally be a new winner at COTA. And for more than half the race distance, it was Movistar Yamaha’s Valentino Rossi who was in lead and looked in total control after Marquez’ fall. However, as impressive as Rossi was at the front, it was Suzuki’s Alex Rins who was more eager to take the win at COTA, for that was going to be his first win in the premier class. 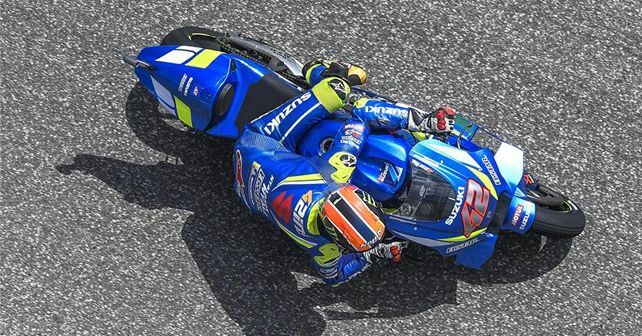 However, while Rins was desperate, Rossi held station and didn’t let Rins run away with it easily. But then, Rins wasn’t going to put a foot wrong, and with four laps to go, he made a move on the nine-time world champion and made it stick. Rossi desperately tried to challenge Rins, but to no avail. Rins took his maiden MotoGP victory, while Rossi was forced to settle for second. Jack Miller of Pramac Ducati took the third place – this was his first podium finish since his win at the wet Assen GP in 2016. The Factory Ducati rider, Andrea Dovizioso, struggled the whole weekend but was able to take fourth, benefitting from the crash of front runners, Marquez and LCR Honda’s Cal Crutchlow. He may have had an average race, but Dovizioso now leads the championship from Marquez, courtesy the Repsol Honda man’s DNF at COTA. Franco Morbidelli of Petronas Yamaha was in top five, as he pipped factory Ducati’s, Danilo Petrucci. His teammate, Fabio Quartararo grabbed seventh place, while Pol Espargaro finished in eighth, thereby, registering KTM’s best ever dry weather result. Francesco Bagnaia of Pramac Ducati finished 9th, while Takaaki Nakagami rounded out the top ten and he was also the only Honda rider to finish the race since Jorge Lorenzo retired from the race owing to a mechanical issue.